In the winter, we have a hard time keeping our spirits up. There’s nothing exciting to see as there aren’t any leaves on the trees, and everything is either one sad dead color or covered in white. Even the sun doesn’t feel like showing its face much, which means we feel sleepy more often than not, and start to feel a little sad. If you want to offset the increased melatonin your body gives you when winter has struck, it’s best to have bright lights on to tell your brain you want to be awake. Of course, your house lamp would need to overhaul it to give you the proper amount, so you might want to find another means of making sure you get enough light. 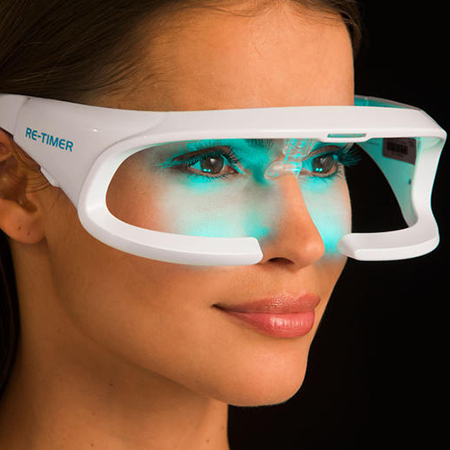 The Light Therapy Glasses use a soft green light from four integrated LEDs that shine 3.5cm away from your eyes. These settle on top of the bridge of your nose, so you can wear these with glasses on, and it won’t inhibit your vision whatsoever. Using these for 30-50 minutes a day can help you with fatigue, jet lag, seasonal affective disorder, and mood swings. The Li-ion polymer rechargeable batteries can last for up to 4 hours on one charge, and only need to be hooked up via USB for about 3.5 hours be back up at 100%. These will cost you around $241, but if you don’t want such a pricey gizmo, there are other options out there.